It’s beginning to look a lot like Christmas. I got the house decorated and it is as good as it is going to get. I don’t do nearly as much as I used to do but the one thing that I always put out without fail is my Christmas teapot collection. I found a new little gem at a local thrift shop (my favorite shopping place these days) for only $3. I loved it and it made me smile to know that I could add it to my Christmas collection. 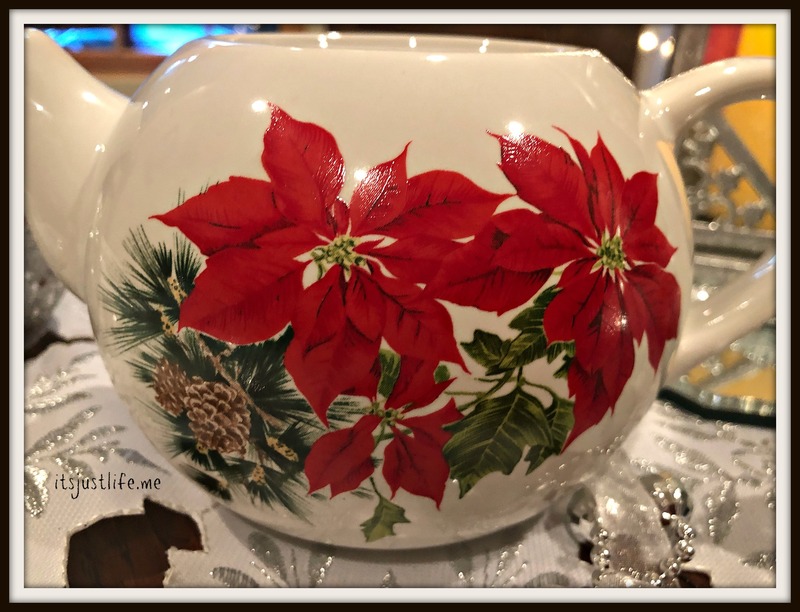 There is something about a poinsettia teapot that catches my eye. Perhaps that is why I have 5 in my collection that sport this lovely Christmas flower. With cats in the house I don’t risk having a live plant but having it on teapots is okay. Are you getting in the mood? It is nice that I am actually ready a little bit early this year so that I have some time to enjoy baking cookies and getting in the spirit. How about you? That is a very sweet Christmas teapot. I have had my tree up and lights on for a couple of weeks but I’m going back to Canada to see mom and my grandkids soon so I wanted to be able to enjoy it. I’m having a baking marathon with my 11 year old friend on Thursday. It is nice to be ready early. Enjoy the season!! That pattern looks so familiar, I wonder if my mom had something with it. I don’t think it was a teapot…but maybe some plates? What a beautiful tablescape and elegant pot! Thanks, Katy. And thanks for stopping by! Lovely! I’m going to drink a cup of tea today in your honor.😘 But it will be from a tea bag imagining it is loose tea in a beautiful vessel. Oh, that Christmas teapot collection is perfect and certainly not a display most anyone else has in their house. That makes it even more special. I don’t like to decorate and have only my vintage pine cone Christmas tree (made by my godmother) out and a Christmas painting by my father-in-law hanging in the dining room. Our Charlie Brown Christmas tree has been in the garage for a week plus. Randy never wants it up early due to drying out and becoming a potential fire hazard. I’ll set out other decorations. But I need Randy to dig them out of storage. It’s nice you have a few vintage items that you still are able to use that hold memories for you. My mom made one of those pine cone wreaths —I wonder what ever happened to it. Hmmm….I am sure she gave it away years ago. Oh I love the sweet Christmas teapot. I have started to decorate but have more to do. 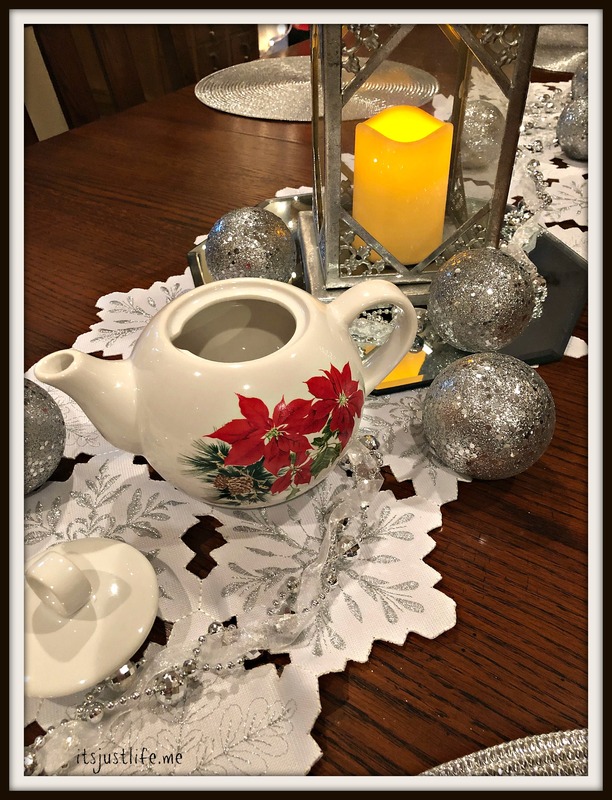 Love how you display your Christmas teapots. I have my big hutch all lined up with them and also my little counter above the counter (if that makes sense) in the kitchen. I always love to see my holiday pots front and center. Pretty poinsettia tea pot. Perfect for Christmas tea. It is a pretty one, isn’t it? And a bargain find at that.